Our cottage is actually three buildings; the main cottage built in 1894, the carriage house presumably built in 1894, and the recently constructed detached garage. Having three separate buildings poses advantages and disadvantages. Our largest advantage is privacy for ourselves and Jr., our young adult son. The most evident disadvantage is mechanicals; electrical, plumbing, HVAC. 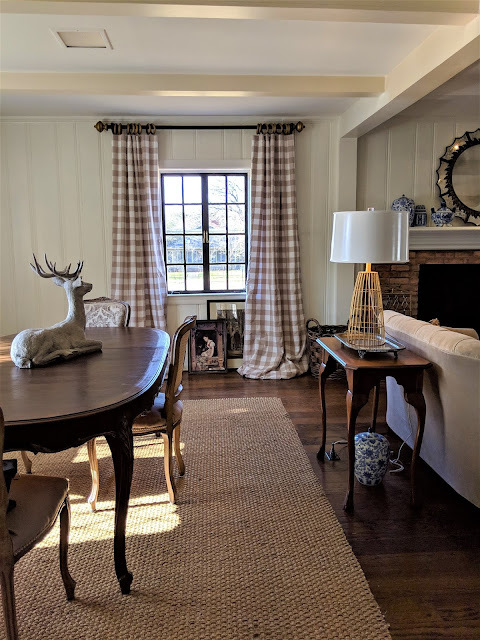 Each building being separate results in oddities; while the cottage has a central hvac system, the carriage house bedroom and game room above the garage both have window hvac units. 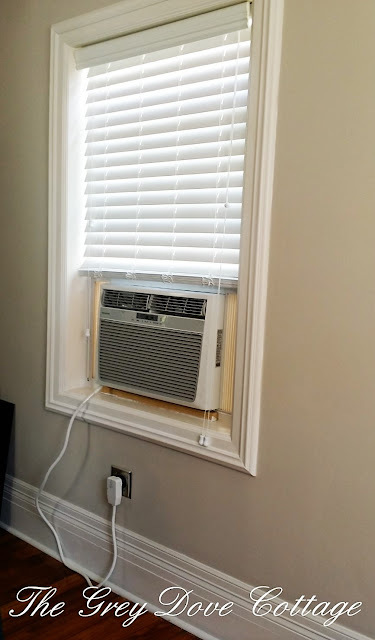 Unfortunately, window hvac units are not at all attractive. Faced with a dilemma of how to camouflage the necessary units, yet maintain use, and accessibly I considered shutters. 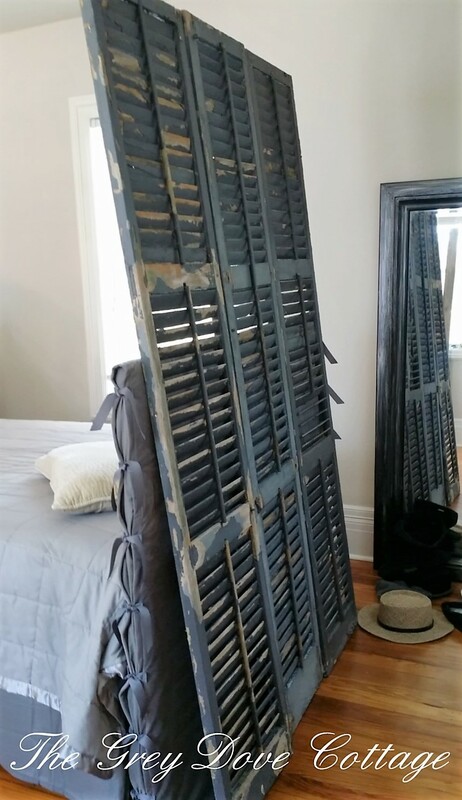 The cottage seller was kind enough to gift us the remaining original shutters to our cottage. While not structurally sound; the chippy paint, and smoky grey color made my heart sing. Feeling these treasures needed to be preserved and used in a special place, they inspired a cover for the hvac units. The shutter slats allow airflow, and light, while obscuring the view of the actual unit. This project would also be great for windows with unfavorable views. The cover was a fairly simple construction project. We began by measuring our window, a standard 34" wide by 58" tall. We chose to cover the unsightly cord and outlet for the unit as well, constructing the frame for the shutters just above the baseboard. 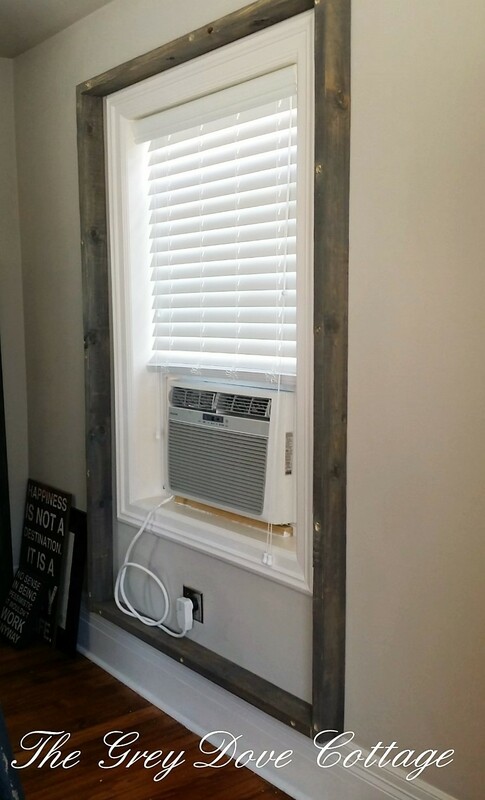 We used 2 X 4 pine boards to allow enough depth from the wall to close the shutters over the window unit, which pultrudes past the frame. Our gifted, vintage shutters; each being 18" wide and 84" tall, determined the size of our frame. 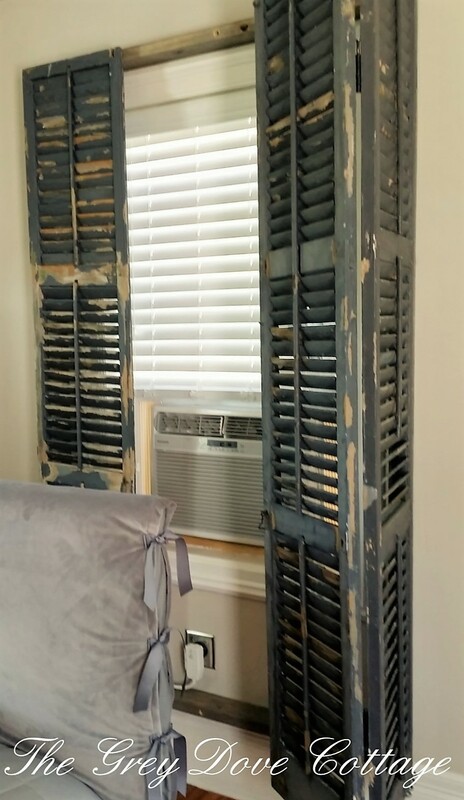 Three of the shutters covered a width of 54". We cut two boards at 54" for the horizontal cross boards and two boards at 84 for the vertical edges. 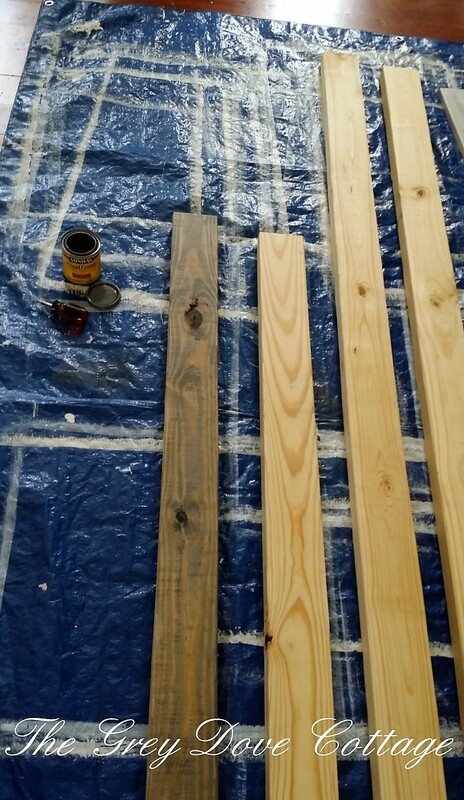 I stained each board using Minwax, oil based "Classic Gray" stain. I chose a stain to coordinate with the shutters because stain is transparent; the color can be built up and the grain of the wood is visible through the stain. I felt the stained frame would work well with the chippy shutters. Paint is an option if you want a more solid colored frame. I stained my boards a top a tarp, and used protective gloves to prevent the stain from staining our floor and my hands. I allowed the boards to dry over night. We located the studs in the wall and took down measurements. We predrilled the holes in the boards based upon the measurements for the studs we located in the wall. We mounted the boards to the wall with the 4" sides perpendicular to the wall using 6" sheetrock screws. The 4" depth was needed in order for the shutters to be able to close flat over the window unit. We used a pair of 4" heavy door hinges to mount the shutters to the frame, and four smaller 2" brass hinges to attach the shutters together. 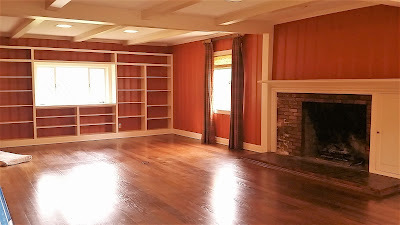 We used a set of four hinges due to the height of our shutters. Follow manufacturers instructions and recommendation on applying the hinges to the surfaces. We predrilled the shutters on each side to attach hinges for hanging. We also predrilled the shutter frame as well. Predrilling prevents splitting of the wood. We applied our door hinges to each side of the frame, mounting at 12" from the top and bottom. We mounted the pair of hinged shutters to the door hinges already attached to the frame on the right, and the single shutter to the door hinges already attached to the left of the frame. 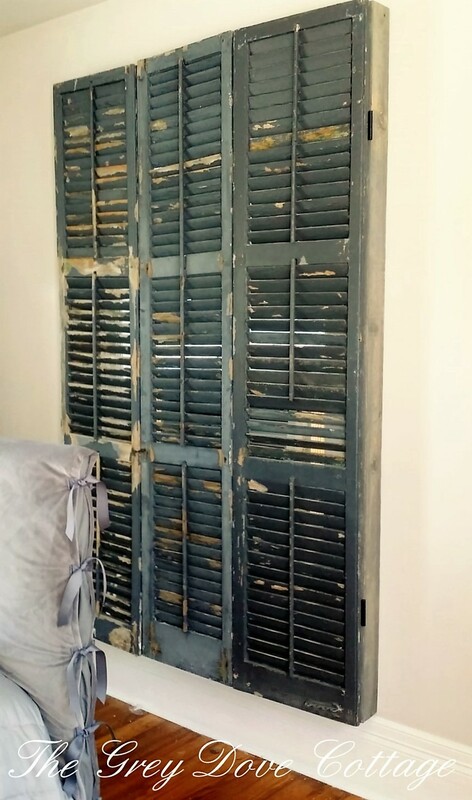 Our gifted shutters were dressed with a vintage hook and eye for latching the shutters together. 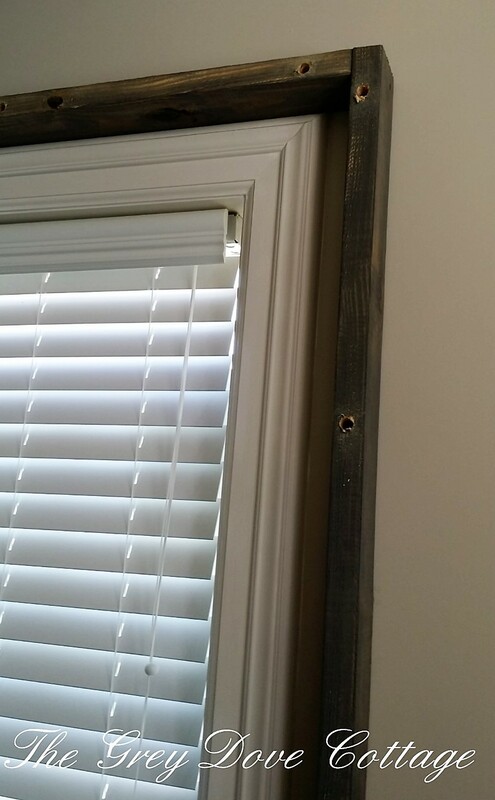 A hook and eye can be purchased in the hardware section of any home improvement center, and would need to be mounted upon the center of the shutters where they meet. The hook and eye latch the shutters closed.